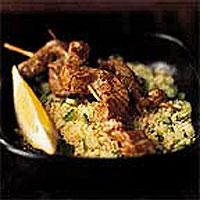 Serve with couscous or bulghur wheat with added lemon juice, chopped salad onions or cucumber and chopped fresh parsley or coriander. Combine the lime juice, soy sauce and salad onions in a dish, then add the tuna strips and turn to coat. Marinate in the fridge for up to 1 hour, turning the fish in the marinade halfway through. Thread the tuna onto wooden skewers. Place on a rack in the grill pan and pour over half the marinade. Grill for about 3-4 minutes, then turn and pour the remaining marinade over. Grill for a further 3-4 minutes, until just cooked. Soak the wooden skewers in water for 10 minutes before use - this will prevent them from scorching under the grill.